This page covers advantages and disadvantages of Incandescent bulb or light. It mentions Incandescent bulb advantages and Incandescent bulb disadvantages. Incandescent bulb or lamp is a light with wire filament which is heated to such high temperature so that it glows by producing visible light i.e. incandescence. When electric current is passed through the filament, it gets heated. 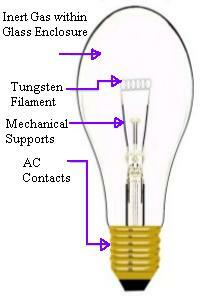 The glass bulb is filled with inert gas in order to protect filament from oxidation. The figure-1 below depicts AC volt incandescent bulb. ➨It is less expensive due to lower initial cost. ➨It is easier to dim with rheostats. ➨It produces warmer color compare to fluorescent and thungsten-halogen lamps. ➨It generates relatively high light output. ➨It can be dimmed or controlled. ➨It is available in various shapes, sizes and applications. ➨It can be switched ON immediately. ➨It has very short lamp life time i.e. about 1000 hours typically. ➨It is warm source of light and hence requires air conditioning to cool the room. ➨It has higher operating cost. ➨It is very fragile and hence needs to be handled very carefully. ➨It generates low lumen per watt. Ordinary incandescent bulbs produces about 5 to 20 lumens per watt. This means it has lower efficacy.